Android has become one of the most popular smartphone operating systems of recent times. Apple too considers it to be a real competitor. Also recent figures show that Android is growing faster than the iPhone, and gaining ground quicker than Apple ever could have imagined. So, since Android has become a powerful operating system, you will find many posts and articles on it being better than iPhone OS. But this I thought of turning the tables around. Let me show you why iPhone is better than android. Both the Android and Apple Product has seen great development in 2012. iPhone 4S with Siri loaded, become one of the hottest selling smartphone whereas the new iPad become one of the hottest tablet ever sold. 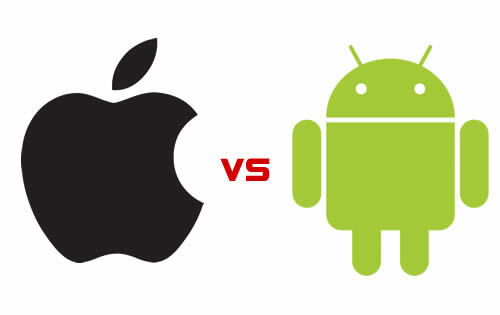 Now check out the reasons as to why iPhone or iOS devices outsmart Android OS. The App Store is actually the major factor. Apple has successfully started the whole app store revolution for smartphone devices thus being able to grab major head start. The Apple app store is a lot bigger than the Android app store. There’s over 700,000 apps currently available on the Apple App store, while Android is nearing the 900,000 mark. But note that Androids figures are made up of multiple different markets and therefore there is no where you will find all the 480,000 apps. However, on the other hand you will find a lot more of the bigger names and titles on the Apple app store than on the Android one. It is also seen that the Apple app store is more stable compared to Android due to Apple’s strict app approval procedure. Even with the recent builds of Android to become stable and reliable, it is still not being able to match iOS 6 or previous iPhone firmwares. The iPhone operating system is plainly solid, stable and reliable. It hardly crashes or freezes up and is straightforward. Android on the other hand may be quicker at times but it tends to freeze up a lot more than the iPhone OS. Even with the most recent Froyo 2.2 edition of Android, it still freezes up. It is also seen in Android phones that error messages of failed processes randomly pop up at the most inconvenient times. In terms of media iPhone OS is a clear winner because of its brilliant music application, easy podcast and video management and the iTunes store. Android on the other hand has no music store as such, but users in the US & UK does have access to the Amazon Store. The iPhone eco-system with iTunes is just the best out there with the biggest variety of music, films, tv shows and podcasts all readily available for download. This is where Android lacks behind. It is deficit of a decent music and video app with a proper method of syncing with the computer. They may include it in the future. But as of now, we only have to wait. Apple has made a niche for itself. When people buy an Apple product they seem to feel like they are a part of an exclusive club. It was seen that when iPhone first came out in the market, rarely people were cited with it. But now, every second person seems to have one. The Apple’s loyal fanbase will always buy any of their new products, no matter how expensive they are. This is the brand potentiality liked to the phone. Well, no other company that gets people lining up all over the place for hours and days just to be one of the first to get their hands on the latest release. Even, Android doesn’t have such a large fan base. Thus Apple has no match at all. Whereas Android is seen more with the techno savvy, iPhone is actually for everyone. iPhone is much easier to use compared to Android. Anyone can navigate it without having to learn. Everything seems just plain natural. But with Android there are key things that make it complicated. I watch people struggle to unlock my HTC Desire (you swipe down instead of across) and then when they finally unlock it they only swipe to the right to view the different home screens, they don’t realize there is just as many to the left until I tell them. Thus iPhone OS is much more handy to people. Even for developers, the iPhone OS is easier to work with because there is only one testing platform for them. But with Android, they have to cater for multiple ones, some have touchscreens, some have buttons and so on. Again, Android OS advocated many releases every now and then that keep on struggling with each other. More over, Apple has been constantly releasing iOS update (Apple mobile OS), which always add some extra features.